Since the dawn of good times the symbolic Rasta colors have often been in play. The colours brings warmth for many and of us symbolize playfulness and freedom. To the Rastafaris though the three iconic stripes has a lot more meaning. Behind the colors: The three colors represent the Rastafari way of life. The green is for the earth that people walk on to which Rastafaris feel a special connection and that needs nurturing and protection. The yellow symbolize the light and love which shines on us all and should be shared everywhere. The red is symbol of blood of all living things in the world and signalize the call for equality to all. Krom Rasta is created with the KROM SCOPE. To help you track the hole from any angle. Paint is sticky enough for lighthouse. 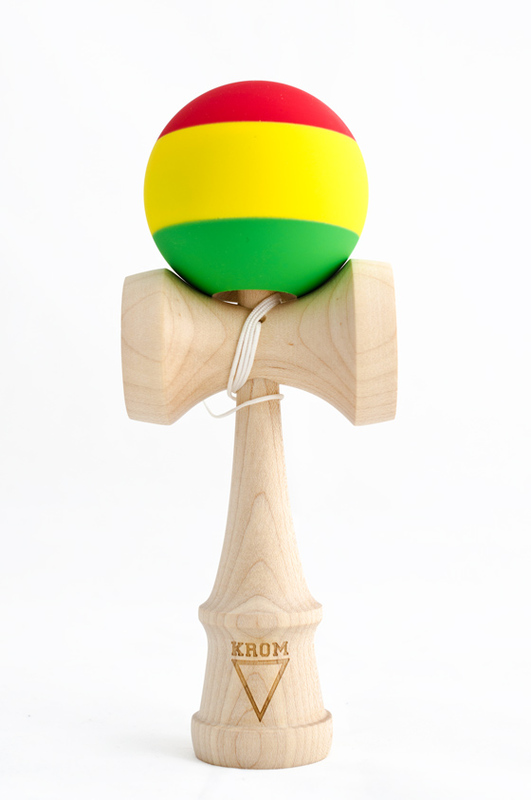 Package includes a super honed KROM Rasta kendama, sticky enough for boeardes slich enough for Lighthouse. Extra string, bead and stringing tool.